Front row, L to R: CMU President Farnam Jahanian, Allegheny County Airport Authority CEO Christina Cassotis. Back row, L to R: Raj Rajkumar, director of CMU's Metro21 Smart Cities Institute, Sam DeMarco, Allegheny County Councilman-at-large, PA 18th District Congressman Conor Lamb, County Executive Rich Fitzgerald. Image courtesy of Pittsburgh International Airport. In 2017, Pittsburgh International Airport was named Airport of the Year by Air Transport World, a respected trade publication. Now Pittsburgh International wants to be known as the world’s smartest airport. 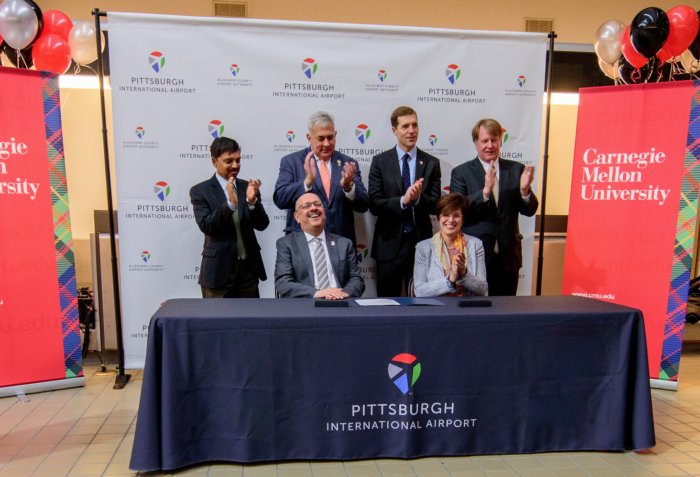 On April 19th, the Allegheny County Airport Authority signed an agreement with Carnegie Mellon University to provide cutting-edge technology to enhance travelers’ experiences. Last September, $1.1 billion was earmarked for a new terminal and other improvements at the airport, with construction slated to begin in 2019. Until then, faculty and students from CMU’s Metro21 Smart Cities Institute will develop apps and other smart technologies. Uses include more efficient security screenings–like knowing when to arrive when lines are shorter–and easier access to parking and where to find the empty spaces–and beyond. Farnam Jahanian, the president of CMU, says the partnership reflects two trends: societal and economic transformation through unprecedented access to digital technology and information, and the increase of population in urban areas. The CMU researchers will be charged with making improvements at the current airport and consulted on plans for the new terminal. 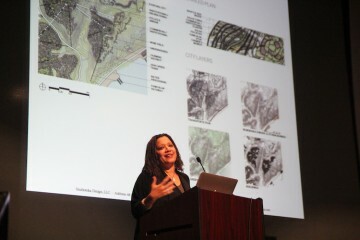 Cassotis says it’s important to give the Metro21 team the freedom to be innovative and think outside standard parameters. Different perspectives are not only going to be encouraged but will be crucial when construction begins on the new terminal. Funding for Metro21’s work at the airport is provided by The Heinz Endowments, Henry L. Hillman Foundation, and Richard King Mellon Foundation. State and federal grants are expected to supply additional funding, as are companies that work on airport innovations.